If your order weighs less than 13 ounces, save huge on shipping with USPS first class (with tracking number). This product weighs 2.8 oz. 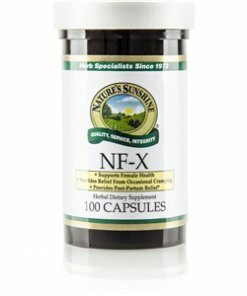 Nature’s Sunshine NF-X provides nourishment for the female reproductive system. Goldenseal root, capsicum fruit, ginger rhizome, uva ursi leaves, cramp bark, squaw vine whole plant, blessed thistle aerial parts, red raspberry leaves, and false unicorn root join forces in this formula to promote female glandular health and to tone female reproductive organs. NF-X also may support hormonal balance.